No registration will be accepted after August 27. Beginning July 27, 2018 the online registration link will appear at the bottom of this page. Eligibility: Open to all artists, original work only: no copies, crafts, giclée copies of paintings, or class/workshop pieces. The Guild will be accepting works in the following 3 categories: painting (including mixed media, collages, computer generated artwork, print making), sculpture (including wood, glass, ceramic) photography (original work of the submitting artist. For composite images, no elements to be produced by others). Artwork previously shown at the Guild will not be accepted. Entry Procedure: All entries must be submitted on line as digital jpg image files. The judges will review the digital jpg images to select those suitable for conditional acceptance to exhibit in the show. The final award judging will be based on the actual artwork on display in the exhibit. Up to 3 works may be submitted. Based on the judges’ decision and subject to exhibit space availability, all of your entries may be accepted. Each entry uploaded must be in the JPG format with no less than 2000 pixels on the longest side. Note the placement of the underscores. Do not include underscores in the title of the JPG nor in the Title section of the entry form. If you’re not sure how to size and name your JPG you are urged to have someone help you. JPG creation & registration assistance is available. Click HERE for details. Fee: Members- $15 for one entry; $25 for two entries; $35 for three entries. Non-members- $35 for one entry; $45 for two entries; $55 for three entries. Acceptance: Initial judging will be based on the JPG images submitted. 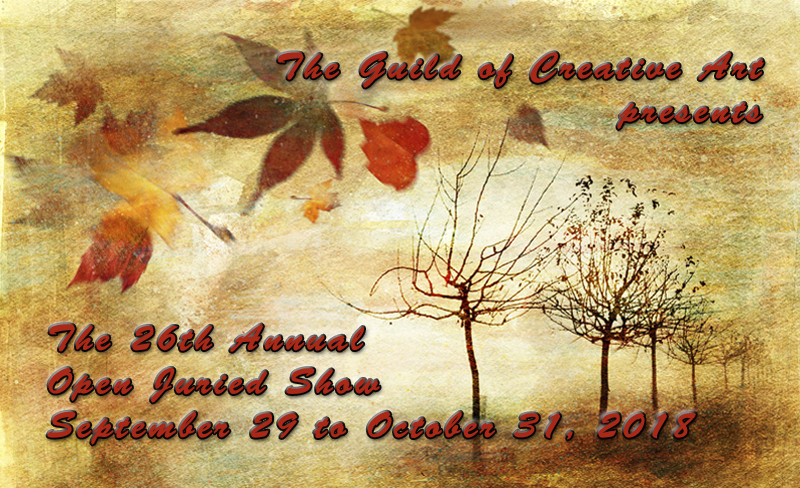 On September 10 a list of artists and artwork conditionally accepted into the exhibit by the judge will be posted on the Guild’s website at www.guildofcreativeart.org. An email will be sent to registrants when the list has been posted. Final acceptance is contingent on the JPG you submitted being an accurate representation of the work you deliver, have excellent quality, and meet all of the requirements described in this Prospectus. Delivery of Conditionally Accepted Artwork: All work must be hand delivered to the Guild on Wednesday, September 26, between noon and 7 pm. No work may be delivered before or after that date and times. Works must not exceed 48″ on any side (including multi-panel works). Works must be suitably framed, wired and ready for hanging. No alligator clips or table top frames allowed. Framed pieces over 36″ in any direction (including the frame outer dimensions) normally displayed under glass must have Plexiglas instead of glass. Wraparound canvas must be painted/printed on all sides, without staples. Work intended to be hung on the walls shall not exceed a maximum weight of 25 pounds. Non-conforming work will be rejected at the discretion of the receiving committee. All artwork must be for sale and remain until the show ends. The Guild receives a 33 1/3 % commission on all sales. Judges: Kenneth Hari, distinguished draftsman, painter and sculptor, and Tova Navarra, author, award winning artist and judge in all media. Awards: Best in Category (Painting, Sculpture, Photography) – $200 each category; Guild Award for Artistic Innovation – $100; Mitchell Award for Acrylic – $100; Friedlander Award for Abstract – $100; Barbara Shieldkret Memorial Award for Abstract Painting – $100; Evinrude Nature Photography Award – $100; Cavaino Memorial Awards for Oil- $100; Cavaino Memorial Award for Watercolor – $100. Bronze Achievement Awards. Additional awards to be announced. All award winners will receive medals. The judges will make awards based on the actual artwork submitted, not on the JPG. Artist’s Release: Artist agrees that accepted works may be used for publicity. End of Show Pick-Up: Thursday, November 2, noon – 7 pm ONLY. Note: There will be a $2.00 per day charge for late pick-up. Works remaining 30 days in storage will be donated to charity. No exceptions. To register click HERE between July 27 and August 27, 2018.